Chapecoense soccer players who did not travel with their team on a flight to Colombia that crashed, mourn during a tribute to the crash victims at Arena Condado stadium in Chapeco, Brazil, Nov. 30, 2016. The Bolivian civil aviation authority has indefinitely suspended LaMia's airline operating permits after its airplane carrying a Brazilian soccer team crashed this week near Medellin, Colombia, killing 71 people. Brazilian and Bolivian news reports say an employee from the Santa Cruz de La Sierra airport in Bolivia told authorities she warned a LaMia representative the fuel onboard was insufficient in the case of an emergency. Celia Castedo told authorities about the observations she made in the flight plan filed by a LaMia dispatcher. Roberto D'marchi gazes into the casket containing the remains of his cousin of Nilson Folle Jr., a victim of the Colombian air tragedy, in the parking garage of the San Vicente funeral home in Medellin, Colombia, Dec. 1, 2016. Because of the large number of casualties, the funeral home had to place the coffins in its parking garage. Forensic authorities say they have managed to identify a majority of the victims of Monday's crash and hope to finish their work Thursday. Folle Jr. was a member of the Chapecoense soccer club's board of directors. El Deber, a Bolivian newspaper, reported Castedo wrote that the plan needed changes and specifically referred to the insufficient amount of fuel for the estimated flight time of 4 hours and 22 minutes between the Bolivian airport and the Colombian city of Medellin. Cockpit audio recordings obtained Wednesday by Colombian media outlets revealed the pilot of the plane repeatedly asking for permission to land because the aircraft was out of fuel and had "total electrical failure." Soccer fans in Brazil and Colombia held tributes Wednesday in honor of those killed. 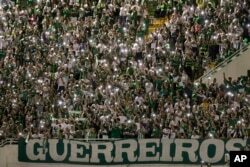 In Medellin, 40,000 people filled the stands where the city's Atletico Nacional club had been scheduled to play against the Brazilian team, Chapecoense. Many fans wore white and carried flowers for the tribute, which included reading the names of the victims and observing a minute of silence. Brazilian Foreign Minister Jose Serra addressed the crowd, noting the two teams’ common white and green colors as a sign of unity. A fan of Brazil's Chapecoense soccer team cries during a tribute to the players who died in a plane crash in Colombia, at Arena Condado stadium in Chapeco, Brazil, Nov. 30, 2016. "We Brazilians will never forget the way Colombians lived as their own this terrible, terrible disaster that disrupted Chapecoense's dream," Serra said. In Chapeco, Brazil, people gathered at the same time in their stadium for a vigil of their own. Alfredo Bocanegra, head of Columbia's civil aviation agency, told reporters that planes must have extra fuel to fly at least 30 to 45 minutes to another airport in a case of an emergency. Investigators also are considering the possibility that a leak caused the lack of fuel. "If this is confirmed by the investigators it would be very painful because it stems from negligence," Bocanegra told Caracol Radio. Supporters of Brazil's Chapecoense soccer team gather for a memorial to remember the players who died in a plane crash in Colombia, at Arena Condado stadium in Chapeco, Brazil, Nov. 30, 2016. Six people survived the crash. Among them were three members of the Chapecoense soccer team — at least two of them with substantial injuries — a journalist, and two members of the flight crew. Brazilian goalkeeper Marcos Danilo Padilha initially survived the crash, but "died while being transferred" to a hospital, officials said. The crash prompted the South American soccer federation to cancel all activities until further notice.